We've all heard the reports that say that Europeans (particularly the French and Italians) are so much healthier than Americans because they have that daily glass (or 2 or 3...) of wine every day. Well, the fact is that it is not the wine itself that is providing the health benefits but the stuff the wine is made of—grapes. Wine has been touted as an excellent fighter against cancer. The reason for this is that grapes contain antioxidants (such as bioflavonoids) and phytochemicals (such as quercetin, ellagic acid, and resveratrol), which come from their stems, seeds and skins. These phytochemicals stifle the spread of free radicals. But in order to reap these benefits you must drink specifically red wine, as opposed to white wine, because the stems, seeds and skins are removed from white wine early in the fermentation process, thereby making it less useful (at least, as far as fighting cancer is concerned). Therefore, it has been discovered, red grapes are more helpful than white or green grapes. Juice is considered the best form of grapes to have because you can consume enough of it to reap the benefits...without getting inebriated. They help cleanse the bowels. Some people go on grape fasts with this intention, but eating only one type of food for an extended period of time does not provide all the nutrients our bodies need. According to Health World Online (http://healthy.net) one way of treating hypertension is to consume one cup grape juice and one cup celery juice each with warm water three times a day for 20 days. After 20 days, rest for 5 to 7 days, then begin another 20-day treatment. Grape juice is known for its blood-purifying properties, which makes it good for mouth infections and abscesses. They can minimize symptoms of allergies because quercetin inhibits the release of histamine. Also, grapes have anti inflammatory properties. The resveratol in the skins have been shown to inhibit blood-platelet clumping and blot clot formation that can lead to heart attacks. They raise good cholesterol (HDL), while inhibiting bad cholesterol (LDL). Researchers at the University of Wisconsin Medical School in Madison conducted a study (as reported in Circulation magazine in 1999) wherein patients with heart disease were asked to drink a glass of grape juice daily. The experiment resulted in reduced LDL and reduced plaque in the arterial walls. Grapes have been shown to have antibacterial and antiviral properties. 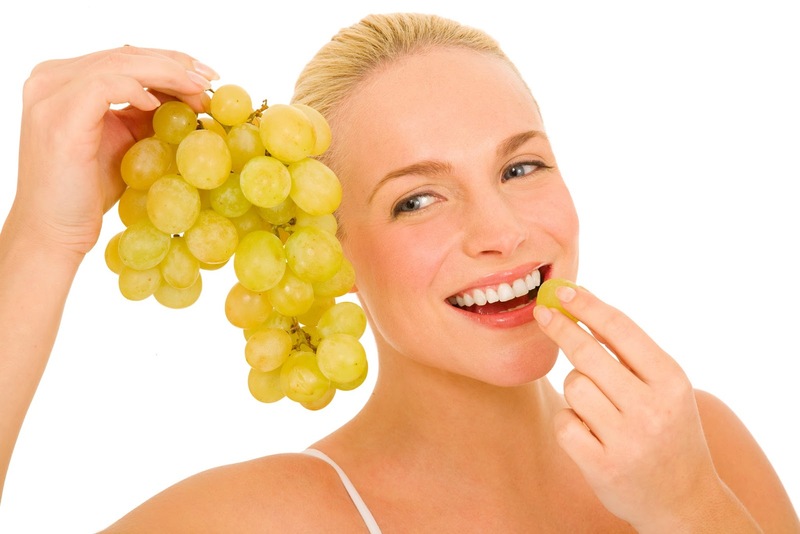 Grapes can be a woman's best friend because of the bioflavonoids they contain. According to Dr. Susan M. Lark in her book The Menopause Self Help Book, bioflavonoids can be used for estrogen replacement, and can control symptoms of menopause, such as hot flashes, fatigue, irritability, and mood swings. Grapes also have a lot of boron, which is necessary for good bone health and protects against osteoporosis. 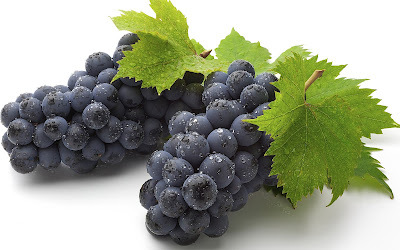 One cup red grapes contains: 13 mg calcium; 9 mg phosphorus; 176 mg potassium; 1 g dietary fiber; 9 RE vitamin A; 4 mg vitamin C; a fair amount of manganese and B vitamins; and trace amounts of thiamin, riboflavin, niacin, and iron. A word of caution: Grapes are heavily sprayed with pesticides. So, if possible, stick to organic grapes. If you cannot get organic grapes, wash them very well. Make green grape, red grape, and black grape sorbets: Making 1 sorbet at a time, in a blender purée sorbet ingredients until sugar is dissolved, about 3 minutes, and pour through a fine sieve into a bowl, pressing on solids. Discard solids and freeze each sorbet in an ice-cream maker. Transfer each sorbet as made to an airtight container and in freezer harden until firm. Sorbets may be made 1 week ahead and kept frozen, covered. 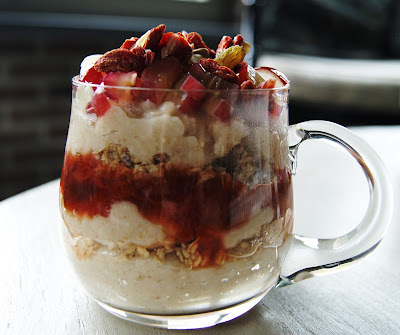 Using a soup spoon, scoop sorbets, alternating flavors, into 8 parfait glasses. Makes about 1 1/3 cups of each sorbet. Put the bread in a bowl and add water to cover. Let soak for 5 minutes until softened. Meanwhile, place the almonds and garlic in a blender container (or, if using a hand-held blender, into a mixing bowl) and pulse until almonds are finely ground. Squeeze out the water from the bread. Add to the food processor. Blend to a smooth paste. With the motor running, add the olive oil in a slow stream, then the vinegar and salt. Thin the ingredients with 1/2 cup of water to the desired consistency. Place the blended contents in a tureen, wooden bowl or pitcher and add about 2 cups of water. Taste for seasoning, add more salt and/or vinegar if necessary. The soup should be fairly tangy. Chill until serving time. Stir before serving into bowls. Garnish with grapes. Place a few grapes in the bottoms of tall, stemmed parfait, wine, or sundae glasses. Top with a tablespoon or two of sour cream, then a teaspoon or so of brown sugar. Repeat until the glasses are filled to the desired level. Garnish with a single grape on top.